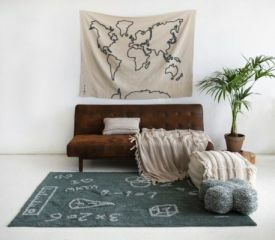 Inspired by the tie - dye style, Lorena Canals has created the Tie - dye collection with rugs and accessories to match each other. These designs have a mix of colours thanks to the dyeing and knotting technique that bring a unique effect and hippie style. It is perfect for any living room, from youthful rooms to living rooms.